I price matched with House of Fraser who currently have the machine at £580.99 but if you trade in an old coffee machine (I literally traded in a crappy old tassimo) you get a further £150 off. All in all - £430.99 which I think is a very good deal for this particular machine. £430.99 for a coffee machine? Its defo a good price off list but a hot deal? Voted hot as for those that can afford it, its a good deal! stupid question time, do you do all this instore? No, you can do this online. You just have to "promise" that you will take in your old coffee machine next time you visit a John Lewis store. I just went in because it was near though and wanted rid of my old machine. It's very premium feeling and looking, I love it! lastb question, can you get a mug under the spouts? I know some are just built for espresso cups. fallen foul to that one before! There will be a day when it goes below four hundred quid on Amazon. I'll buy it then. Have requested a price match from John Lewis and unfortunately the price match will only be refunded after purchase and for the difference to the actual paid price (i.e. after £150 discount) so the offers will not stack. Have requested a price match from John Lewis and unfortunately the price … Have requested a price match from John Lewis and unfortunately the price match will only be refunded after purchase and for the difference to the actual paid price (i.e. after £150 discount) so the offers will not stack. They do - you must have spoken to someone who doesn't know what they are talking about. See my receipt from the first post. They do - you must have spoken to someone who doesn't know what they are … They do - you must have spoken to someone who doesn't know what they are talking about. See my receipt from the first post. Surely you must have done that in store rather than online then? Unless they sent you a link to reduce the price? Surely you must have done that in store rather than online then? Unless … Surely you must have done that in store rather than online then? Unless they sent you a link to reduce the price? I actually did it over the phone but did email them a few times beforehand... They will do it, you just need to speak to someone who knows what they're talking about. I have admittedly spoken to a few idiots from John Lewis in the past. I actually did it over the phone but did email them a few times … I actually did it over the phone but did email them a few times beforehand... They will do it, you just need to speak to someone who knows what they're talking about. I have admittedly spoken to a few idiots from John Lewis in the past. I submitted a price match last night and I have just received confirmation that they are happy to match with HoF. The email makes it very clear that I can claim the £150 trade in and the price difference, giving a net price of £430.99 as per the OP. I now need to decide whether to get one as I already have a couple of Delonghi bean to cup machines. We use one for ordinary beans and the other for decaf. I submitted a price match last night and I have just received … I submitted a price match last night and I have just received confirmation that they are happy to match with HoF. The email makes it very clear that I can claim the £150 trade in and the price difference, giving a net price of £430.99 as per the OP.I now need to decide whether to get one as I already have a couple of Delonghi bean to cup machines. We use one for ordinary beans and the other for decaf. I have checked with House of Fraser and have found that they do not currently have stock of the De'Longhi coffee machine, therefore on this occasion I cannot match the price quoted by House of Fraser. We carry a wide range of lines and our competitor has to have the line in stock (rather than available to order) for us to match the price. We deliver value to our customers by promptly supplying the product they require, either to take away or be delivered in a reasonable timescale. I am sorry I have not been able to reduce the price on this occasion. If you require any further information or assistance please do not hesitate to contact me. OK so it's now no longer available online - you will now have to price match this through your local John Lewis to your local House of Fraser. You can do this over the phone and get it delivered to your house. Manchester have 3 in stock - you can check your postcode to see if any are local. John Lewis Trafford Centre will price match HOF Manchester. HOF are not... They are doing anything it seems to not price match this. I even think they bought the remaining coffee machines from HOF online haha, wouldn't put it past them! finally got my online approval, but I am worried about the 150 trade in bit. the email is really heavily worded on the difference being taken on the final price, so post the 150 discount. might just take a punt and argue with them afterwards! jamesakabob would you be able to message me your case number as well, please? thanks! will happily give mine once my refund has come through as well. just being a little cautious until that money is back on my credit card. hughes.co.uk/sma…uct - £576 without any hassle of trade in. There will be a day when it goes below four hundred quid on Amazon. I'll … There will be a day when it goes below four hundred quid on Amazon. I'll buy it then. That day has arrived today! Buy!! Firefly1 you are brilliant! Thank you. Order placed. I am seriously tempted to buy too. I would get this if it was genuinely an amazing deal, but the above model was only £349, and this is still £399 (Or I've got it down to £385 with student code and Prime £5 voucher for topping up £70). I have no idea whether this is just another basically identical model, at a higher price, being made to look like a fantastic deal. 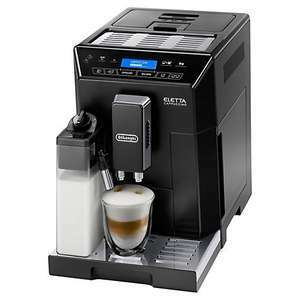 I think that machine at Currys is an older model that has had the upgraded milk system added, I have seen an identical looking thing that ony did cappuccino. Good price though.